For the outdoor enthusiasts, a little adventure would be right up their alley! We have the Channel Islands National Park in our backyard. Some of the most beautiful sea caves in the world can be found at Scorpion Anchorage on Santa Cruz Island and the Adventure Sea Cave kayaking tour is a fun and exciting way to explore the park. Comedy Hideaway in Santa Barbara offers big laughs in an intimate setting, with visiting comedians from Netflix, Comedy Central and more. General admission tickets are $30 each, and they often run Groupon deals. Food and drinks are available for an all-around great evening for SO’s, friends and family. Tired of giving wine enthusiasts a bottle of your favorite? Let Santa Barbara Wine Country Tours take the wheel and send them on a wine tour to the beautiful Santa Ynez Valley, Napa’s So-Cal sister, to pick out some new favorites of their own. Enjoy three wine tastings and a gourmet lunch while learning about what makes our wine region so unique. A great family friendly experience is a year-long membership to the Santa Barbara Museum of Natural History, which also includes entrance to the Sea Center on Stearn’s Wharf and more than 330 other museums and science centers worldwide. An excellent gift for folks who have a passion for the natural world, from planets to intertidal wonders and everything in between. 5. A Gift Certificate for any outdoor activity! If you’re itching to give an adventure but don’t want to limit the options, a Santa Barbara Adventure Company gift certificate that lets your loved ones decide themselves is a great choice! 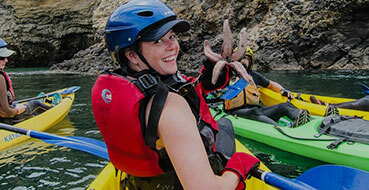 From surf and SUP options, to kayaking and bike tours, there is undoubtedly a perfect match to pick from. What are some of your favorite gifts to give? Let us know!